Although not a “tourist guide” this book is a handy reference for anyone with interest in this land. Munro-Hay’s subtitle: The Unknown Land provides a clue to the problem he faced in summarizing the history and culture of this ancient country. Known to early Christians as the land of “Prester John,” Ethiopia’s nearly landlocked location and rugged terrain has made it a challenge to scholars for millennia. Munro-Hay makes an earnest effort to enlighten us on many aspects of Ethiopian history and culture. Rather than provide a surface overview, he divides the country into regions based on ancient kingdoms. It’s an effective means of organizing the complex store of research he’s brought to the task. After an opening overview of Ethiopian history, the author provides a survey of the role of the Church in the society. For Ethiopia, this element cannot be overstated. Churches and their rituals are a fundamental part of Ethiopia life. He details the structure of church hierarchy and the roles assigned the various officers. Rituals and other aspects such as religious art are also described. Munro-Hay then gives a brief survey of the foreigners who entered the country, evaluating their published accounts. Foreign impact played a major role in how Ethiopia came to be a modern nation, with Portuguese, Arabs and others providing architectural expertise, trade and political developments. Some lasting impact of the Italian invasion in this century is added. 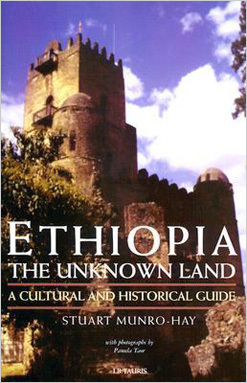 The theme of this book relates the histories of ten important regions making up historical Ethiopia and into modern times. While all had their impact, three are of particular importance. Gondar, situated near Lake Tana, was considered to be ruled by descendants of King Solomon and the Queen of Sheba. Munro-Hay sees the political patterns set in ancient Gondar to carry through Ethiopia history until modern times. The heritage was so important that even usurpers found ways of establishing legitimacy by claiming descent from those origins. Munro-Hay provides diagrams of ancient Gondar and vivid descriptions of what remains from a glorious imperial city. Next in significance is the ancient site of Aksum. Certainly, as Munro-Hay notes, it’s of vital archaeological importance and worth any visitor’s time and effort. Well north of Addis Ababa and on the way to the Red Sea, Aksum nearly disappeared until extensive excavations during the 1970s revealed its importance. The remnants of the city are dotted with numerous stone stelae, possibly inspired by similar constructions in Egypt, Ethiopia’s neighbour. Munro-Hay conducts us on a tour of these and other historical sites in a compelling chapter. As a participant in some of the exploratory work, the author is well-suited to describe what has been revealed. He does so with verve and close detail. In his Forward, Munro-Hay reminds us that at the time of writing, Ethiopia had provided the oldest representative of our ancestry, Don Johanson’s “Australopithecus afarensis,” the 3.6 million-year old “Lucy.” It’s somewhat of a surprise that Ethiopia’s other prehistory doesn’t emerge for another 350 pages. In Yeha, “the beginnings of Ethiopian civilization are rooted,” including the distinctive script still in use. Close to the Red Sea, Yeha appears to have adopted Semitic languages and religious artefacts from its Arabic neighbours. Pre-Christian temples and other buildings may still be seen there. Munro-Hay is an acknowledged leader in the study of Ethiopia. This book is a monument to his scholarship. Rich in detail and presenting both ancient and modern aspects of Ethiopian life, it provides excellent resource material for anyone wishing to pursue the topic. At less than 400 pages, the book is also a worthwhile companion to the traveler. Clearly written and beautifully organized for both scholar and tourist, this book will remain useful for some time.